Hi friends! I hope you're having a great day! I'm blogging twice in one day because I'm apparently some sort of blogging machine. Actually, I wanted to enter this card into a couple of things and didn't want to miss the deadline. Since I never know when the baby is going to let me get things done, I figured I would blog at night while she sleeps. Today, I'm blogging a card I made for Brady's friend's birthday. Brady actually picked out the images and the sentiment. He was SO cute! He pointed to the "hey dude" and thought it was so funny! Then he looked for another set with a birthday sentiment. Then he ran off to play. 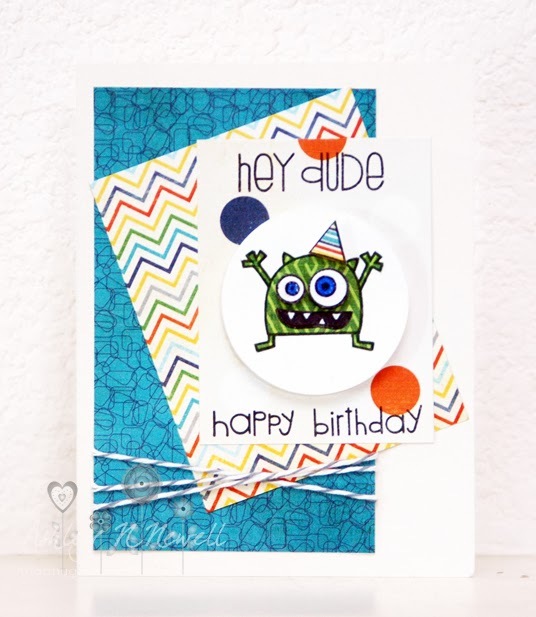 ;) The monster and hey dude are from Paper Smooches Little Fella and the party hat and birthday sentiment are from Paper Smooches Party Posse. The paper is Echo Park's A Boy's Life. I added some Whisker Graphics Oyster Divine Twine and I colored the eyes with Copics then put glaze pen over the top. I'm entering this in the Paper Smooches Jan 19-25 Anything Goes Challenge and the Ribbon Carousel Challenge Love, Birthdays, and Chicken Soup. Super fun birthday card and even better when chosen by the kiddos! Such a fun design too! So cute! Great piecing, loving those papers! This is so much fun...LOVE the bright colors!